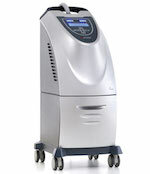 The Viora Reaction laser is the market leader in dramatic cellulite reduction and skin tightening treatments in the US. The Viora Reaction offers three different treatment applicators in one machine, allowing aesthetic practitioners to perform skin tightening treatments on the hips, abdomen face, back and thighs. This all-in-one machine makes it easy to start offering these incredible treatments in your own practice. As an added benefit, the fast treatments times (on average, just 15 minutes), also make it easy to see more patients throughout the day. The first and the only multi-frequency RF machine to receive FDA approval, the Viora Reaction ensures optimal heat distribution at different tissue depths, allowing for easier control over treatment accuracy. Patients will enjoy smoother, tightened skin and virtually painless treatments that deliver impressive results in no time. The Viora Reaction laser utilizes different modes and frequencies in order to deliver the most effective treatment. Each applicator has an RF level and Vacuum Level control for easy adjustments to higher or lower levels depending on the type of treatment that is being delivered, allowing for a more customized patient experience. Interested in adding the Viora Laser system to your practice? The Viora laser system is the perfect addition to any busy cosmetic practice that wants to expand its service offerings to include the most in-demand anti-aging treatments. SunrayLaser.com has amazing deals on used Viora laser equipment with savings that are up to 60% off the original price! See for yourself how much you can save on high quality used laser equipment when you buy from SunrayLaser.com. Looking for pricing information and other details about our selection of preowned Viora laser equipment? Please fill out the form below and we’ll provide a fast and free, no obligation quote. It’s an easy and no-risk way to learn more about this outstanding line of cosmetic lasers.